This Time cover image says it all. When male executives write books, it’s rare to hear someone criticize them if they suggest others take their advice on how to be successful. Sheryl Sandberg writes a book encouraging women to “lean in” and she spends her own money to create a non-profit organization to support other women who choose to pursue careers- and she’s attacked. Some of the criticism relates to her pushing all women to pursue a career path like hers (note: she doesn’t). For others, it’s complaints that most women don’t have the opportunities and resources she’s had. Yes, she’s had opportunities like going to Harvard and having mentors like Larry Summers. But note: she earned the right to go to that school and you can bet she worked to get the grades. In the corporate world, connections- be it mentors or colleagues- are often the key to success. But no one criticizes male executives for their education or connections. Powerful women are constantly being scrutinized in ways that are never applied to men. When Marissa Mayer became CEO of Yahoo!, much was written about her pregnancy and the fact that she would take just a few weeks of leave from work when the baby was born (and would probably work from home during that time). Some women felt that she was setting a bad example for other women who might want to spend more time at home with a newborn. Of course, if she had said she was going to take 6 weeks or more of maternity leave, you can bet the press would be saying- what kind of executive takes over a struggling company and takes time off earlier in her tenure. Either way- she’d be viewed as ‘wrong’ by some segment of the corporate world. More recently, Mayer’s decision to stop all telecommuting at Yahoo! was gusty- guaranteed to be unpopular. But Mayer is all about analytics and you can bet there was good reason for her demanding everyone be at work. There have been tons of articles- mostly negative- about it. [Kudos to Sheryl Sandberg and Whitney Johnson who each have acknowledged Mayer for taking such contraversial action in her attempts to improve the business.] Best Buy just made the same decision; I found just a handful of articles about it- and they were descriptive, not attacks. Remember, Mayer was brought in after several previous CEOs were invited to leave. She is responsible for leading the turn-around of the company and since she’s arrived, stock is up about 45%. in the blog post “While Sheryl Sandberg Leans in, Marissa Mayer lies low” Patricia Sellers, highlights an interesting truth. Sandberg and Mayer are very different in how they respond to their being role models. 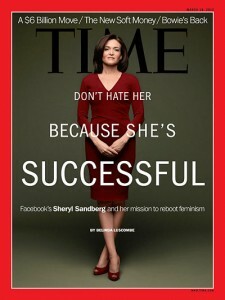 As the title says, Sandberg embraces that role and is using it to inspire other women. Mayer has downplayed it, really focusing on the business at hand. Both are successful, powerful women in the male-dominated world of high tech. They provide alternative examples of how to live in that world. Having choices on how to be in the world- now, that’s a good thing. Last week we celebrated International Women’s Day. We’ve come a long way baby- but we’ve still got a long way to go.